I’m trying to block it out but without success. Toni Hanner’s poetry ranges from wildly experimental to narrative. She enjoys working with forms, particularly persona poems and prose poems. 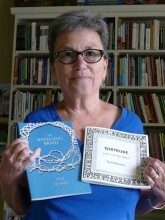 She had two books published in 2012: The Ravelling Braid, from Tebot Bach and Gertrude, from Traprock. She lives in Eugene with poet Michael Hanner.